There are two breeding seasons a year, with young squirrels emerging around February/March and then around August/September. Each litter contains 3-4 young. Squirrel nests are called dreys and are constructed in trees, lofts or other places using twigs, moss, loft insulation and other available material. 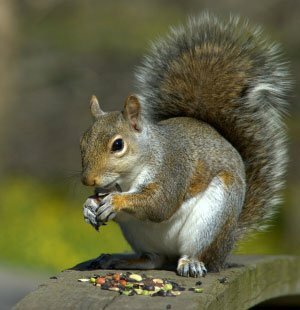 Squirrels are mainly vegetarians and prefer to eat seeds, fruits, berries, and young shoots. They often store food in small heaps, which they bury near to their dreys. They gnaw in the same way as their rat cousins and it is this activity which causes so many problems. They will readily gnaw through electrical cables and soft pipework. Most squirrel infestations are quite obvious. This is usually because the animals are seen entering loft spaces, or because they make so much noise whilst gnawing and nest construction. If in doubt, inspect the roof voids, or areas of activity and look for any evidence of disturbance. Squirrels can be very persistent. Trapping is the best method of control although baiting using an approved rodenticide (which is only available to pest control companies), may be an option in certain situations. If you suspect you have a squirrel problem, call us for more advice on 01992 763776.